After the first training on chicken breeding for disabled people came to a successful finish, COMPED HOME project is organizing the second training again on chicken breeding for disabled people. Ten trainees were selected from different communes (DeyIth, Korky, Cheur Teal and Samroung Thom) of the Kandal Province. The theoretical training course is held from the 17th to 18th August, focusing chicken breeding in generaand and from the 20th to 21st August, dealing with questions of small scale business. Other one day following up training will held on 21st September for practice with vaccination, eathworm-termite raising. 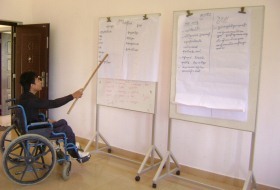 The training is held at the COMPED HOME agricultural center for disabled people. Before starting the lesson, all participants have to take part in a pre-test examination concerning their knowledge of chicken breeding based their own experiences. During the training the participants learn the theory and practice with two model chicken houses. For this purpose, they are being supported by Mr. Tina (CH Trainer). The training also teaches the participants the correct way of mixing market food with vegetables and other feeding stuff, such as earthworms, insects and termites. These kinds of food are high in protein which is an important requirement for successful chicken growing. The chicken breeding can be a change for the better for disabled people and the chance to enrich their lives with new opportunities and skills. Not only the participants but also their families can share this very valuable knowledge, since the participants go back home, when finished at COMPED HOME. With their gained skills concerning chicken breeding and the support of their families, the trainees stand a chance of starting their own business to provide themselves and their families with an income which gives financial safety and a perspective in life. 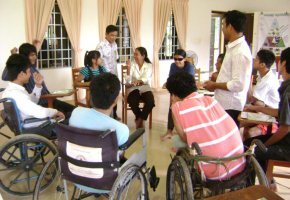 Besides learning skills of chicken raising the participants learn the basics of small scale business from expert lecture of the National Center of Disabled People (NCDP). This in fact enables them to make the best of their business and helps them to have a proper plan of their income and outcome and therefore their investments. The training is held in COMPED HOME in a familial an safe environment which allows every single trainee to learn and practice for his individual best. New friendships may evolve due to the living, working and learning in groups with equal rights and obligations for every participant.